The first is my variation on Nancy Bush’s New England Socks. 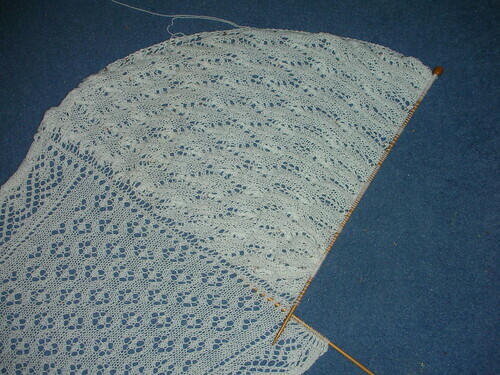 The pattern as written calls for 2mm needles and is to fit a foot circumference of 7.5inches. I need a bit more than that so I shifted up to 2.5mm needles to make the sock a little larger. I stuck with the required 70st cast on but decreased to 65st for the foot to make it nice and snug. With 6 pattern repeats it all fits beautifully and I am very pleased with the result. As you can see I only needed a little bit more to finish the foot and toe so if you had small feet and didn’t mind a shorter cuff you could make 1 skein stretch to fit. Mystery Stole 3 Clue 6. I’m now on tenterhooks waiting for the final clue on Friday which I think will be some sort of edging to the wing and then I get to play lace magic. The conflict will come in choosing whether to finish off MS3 and then steek, or steek knowing that MS3 is compatible with weekday knitting – it may well just turn into a marathon knitting weekend – gosh what a shame! In the meantime I have a new project on the needles – the Embossed Leaves socks from Favourite Socks. I’ve only done the cuff so at the moment it looks like a small green caterpillar. Also hovering in the background is Foxglove – I might try to swatch for it sometime this week, only time will tell!